Difference between revisions of "Test versions"
Test versions of W:A are special game logic versions where one or more test features are enabled. Some of them are meant to be turned into scheme options in the future. They can be enabled in the Host/Join screen using special chat commands: enabling one will cause an appropriate game logic version to be emulated. This prevents them from being cumulative, and enabling a test version will disable the previously-enabled one (if any). BattyRope: toggled by entering the /batty command, BattyRope forces Rope Knocking and allows players' ropes to stay attached between turns; the hanging worms may still be knocked off their rope though. 150% speed: toggled by entering either /150, /fast or /speed, this test version will make the game 1.5× faster, by changing the framerate from 50 to 75 FPS. TestStuff: toggled by entering either the /test or the /ts command, TestStuff (or TS) enables a handful of features. Enabled features include BattyRope, Rope Knocking, the Indian Rope Trick, Girder Radius Assist, Circular Aiming, Anti-Lock Power, Skipwalking Facilitation, and Worm Selection during the Hot Seat Time without ending it. TS also doubles the maximum roping and jetpacking, removes the projectile motion speed limit, and disables loss of control while roping. 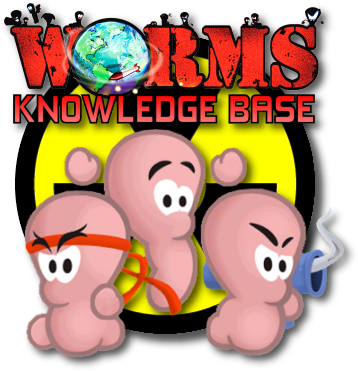 RacingStuff: toggled by entering either /rs, /race, /racing, /racestuff, or /racingstuff, this test version will enable the Worm Selection without ending Hot Seat Time feature, along with Phased Worms (where worms being able to walk through each other without any resistance). BoomRacing: toggled by entering either /boom, /boomrace or /boomracing, this test version will enable the Worm Selection without ending Hot Seat Time feature, along with Phased Teams (where teams can't influence each other, with a few exceptions, listed in the Documentation - these exceptions include the shared landscape and the shared flame limit).